The body of an Arizona man was recovered from Lake McDonald on Tuesday afternoon, Glacier National Park officials reported. The 48-year-old was reported missing by a concerned family member earlier in the day, and his vehicle was located at Lake McDonald Lodge. Ground crews from the park searched the area, to no avail. The Flathead County Sheriff’s Office responded with its dive team to conduct an underwater search, and eventually used a remotely operated vehicle to find and recover the man’s body. His name has not been released, as family members are still being notified. The county dive team regularly trains at Lake McDonald. In a statement released Tuesday night, Glacier Park spokeswoman Lauren Alley said the “exact circumstances leading to the victim’s death are unknown,” but emphasized that foul play is not suspected. An investigation into the man’s death continues, headed by Glacier Park. 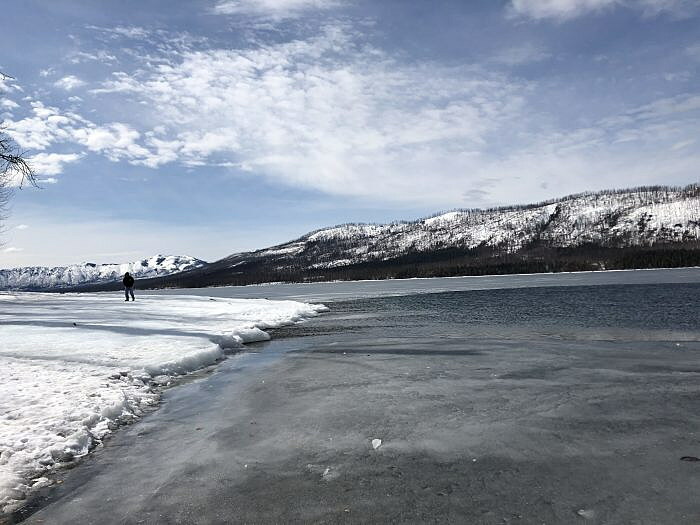 Park officials also stressed that visitors need to use extreme caution at Lake McDonald, which is frozen in some places but open in other areas. Water is flowing out of Sprague Creek, alongside Lake McDonald Lodge, open water is near the lodge and unstable ice is prevalent all around the lake. Alley also reminded visitors that water is a leading cause of death in Glacier, and everyone should stay off the frozen lake and even off rocks near the water.